George C. Marshall (third from right) talks with Harvard President James Bryant Conant on the steps of Widener Library during Harvard's Commencement in 1947. 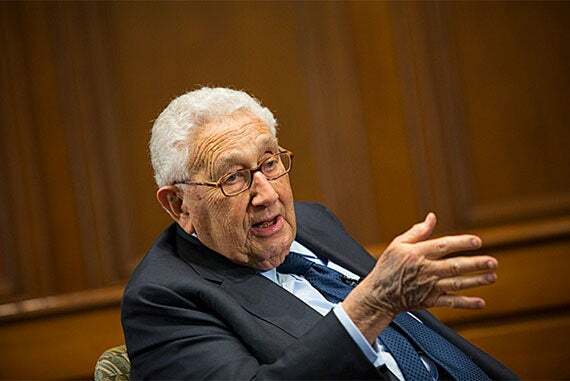 Henry Kissinger recalls the content of Marshall's 1947 Commencement address, which marked a historic departure in American foreign policy. A Friday tour of Harvard’s Memorial Church prefigured a September event honoring America’s highest heroes (photo 1). The visiting trio included Harold A. Fritz (from left, photo 2), Bruce P. Crandall, and Thomas G. Kelley. Crandall spoke with ROTC representative Charlotte “Charley” Falletta ’16 (photo 3).